SPOILERS AHEAD! DO NOT READ FURTHER UNTIL YOU HAVE READ THE ISSUE! 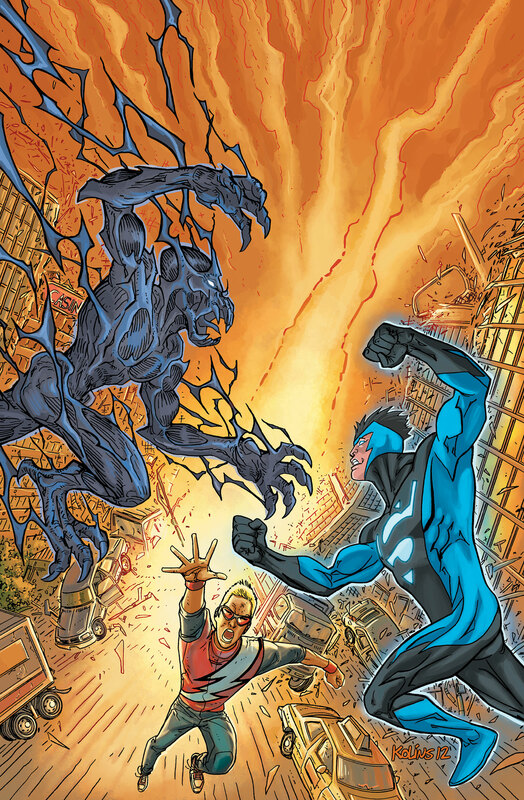 After a brief “memory” of the Earth 2 of the Smallville-verse, we return to the battle for Las Vegas between Superman (wearing a special containment suit that helps him gather and channel Speed Force energy) and the Black Racer. But, Clark is not going to fight this battle alone – Bart has decided to join the fray! Bart has figured out how to stop the Black Racer (with the implication he has recieved advice from other Flashes who are now in the Speed Force itself), and he follows through with his plan…and I can’t say any more. Really. Can’t. Say. Any. More. We’ll come back to this in another article. We also find out a bit more about the upcoming Crisis. We meet one of the Monitors of the Smallville-verse and find that this Monitor is not-so-nice…nope, not at all. This issue wraps up a couple of threads regarding Tess Mercer’s status and Clark’s ability to resume his secret identity, but we are still propelled at a breakneck pace toward the Smallville version of Crisis on Infinite Earths. If you are drawn to this title only because of the storyline concerning the Flash, this may be your jumping-off point as the focus is going elsewhere for now. However, if you are a fan of the Smallville TV show this title certainly delivers for you. Bryan Q. Miller does a wonderful job of bringing the feel and pacing of the Smallville TV series to print. Jorge Jimenez is spot-on with depictions of the actors from the series, and the colors provided by Carrie Strachan and Gabe Eltaeb set the mood appropriately throughout. I just have one problem with this issue…one that I can’t go into here without spoilering too much…watch for another article for that. As far as being well-written, well-drawn and worth the price of admission, this issue is excellent and well worth the read. This entry was posted in Reviews and tagged Bart Allen, Earth 2, Flash, Impulse, Jay Garrick, Smallville on April 3, 2013 by Ed Garrett. Of all the crazy stuff from the comics TV-Smallville adapted, I’m surprised they never took a crack at the Electric-Superman. I appreciate comic-Smallville’s approach towards it. We’ve got a post on Carmine Infantino now, so I’m moving the relevant comments over to that one.